The Best Thai Food in America? To find the absolute best Thai meal in America I recommend the Advanced Thai cooking classes of Kasma Loha-unchit in Oakland, California. Here, you will find authentic flavors and tastes as well as Thai dishes that you’ll be unable to find elsewhere once you leave Thailand. 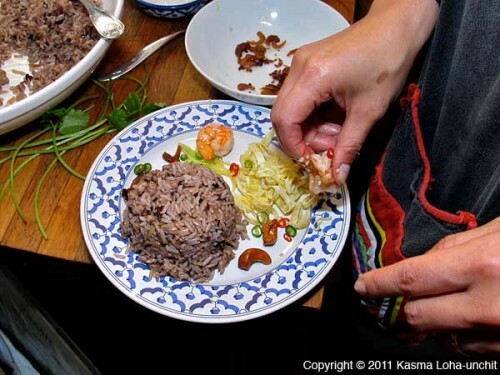 Note: This blog chronicles a day in a weeklong Advanced Thai cooking class that Kasma no longer offers. All of the dishes are taught in her weekend advanced series. 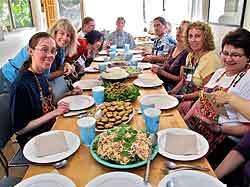 Recently at one of her classes I had a meal that was very nearly a transcendental experience. Here is my blog on that meal. Why is Thai food so popular? I’ve long thought (and read this echoed elsewhere) that Thai food is so good because it contains all of the four major flavor groupings, salty, sour, sweet and spicy hot, sometimes in one dish. (The bitter taste is also found but is less prevalent.) To eat a well-prepared Thai meal is to light up every taste bud on the tongue and palate. The food is also on the light (as opposed to heavy) side so you walk away from the table with a well-gruntled feeling. We usually have at least one person taking every class because he or she traveled to Thailand, loved the food there and couldn’t find food to match it here in the States: they come to learn how to make those great flavors themselves. Many students tell us that after taking the classes they can no longer eat in Thai restaurants back home: they are disapponted by meals that emphasize the sweet and the rich, with not enough spicy-hot and or sour flavors. Kasma’s food from the first Beginning class (and everyone starts with Beginning) is outstanding; the great food is why our Advanced classes are always waiting list only. It’s in the Advanced classes that you get to really explore the variety and depth of Thai food. It’s particularly in the Advanced classes that you get to experience many of the 95% of Thai dishes that Kasma estimates are never found on Stateside Thai restaurant menus. Kasma has 8 Advanced evening series and 4 weeklong Advanced classes. 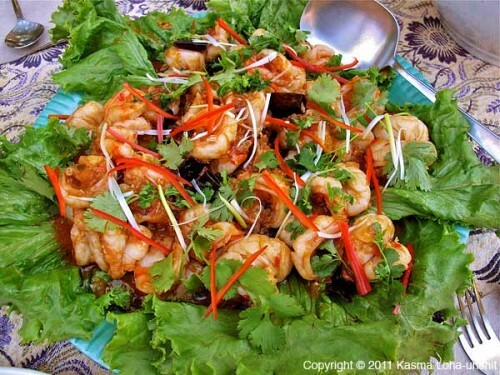 Once you’ve taken all of the classes Kasma offers, you’ll have well over 200 Thai dishes, many seldom found outside of Thailand. What is my criteria for a great Thai meal? It’s understood that every taste bud will be lit up and dancing. 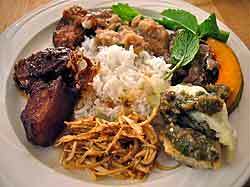 There has to be a variety of dishes: some spicy, some not, different dishes accenting a different flavor or different type of food. Most of all, that I look for is a quality of amazement and regret: amazement comes from taking that first taste of a dish and being delighted at all of the flavors; and regret from the fact that everything is so good, there’s no way to eat as much of it as you’d like. I’ve had great meals in many resaturants in Thailand, such as Ruen Mai in Krabi or My Choice in Bangkok. 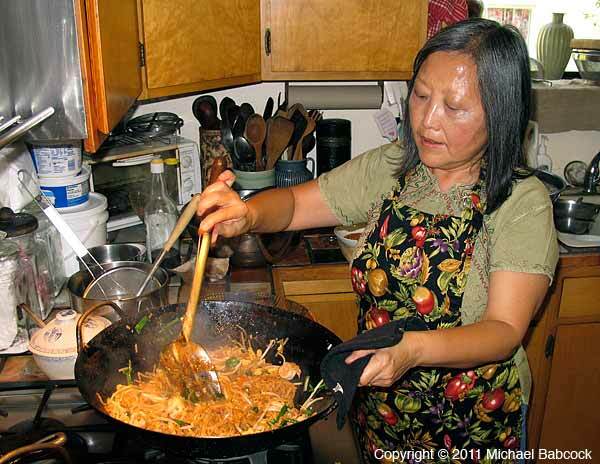 The only place I’ve had a great Thai meal in the U.S. has been at home, often at the end of an Advanced cooking class. 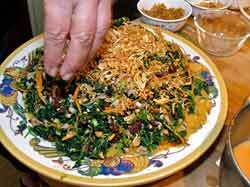 Stir-Fried Cha-om with Bean Thread and Eggs (Cha-om Pad Woon Sen Kai): This dish was actually served as an appetizer; it can also easily by served as a one-dish meal. 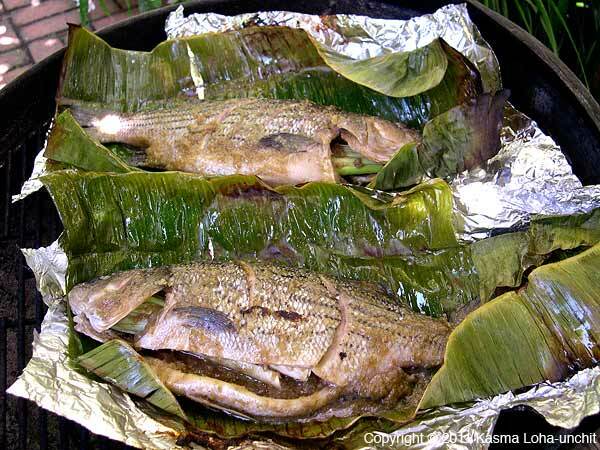 This summer Kasma and I have eaten this dish for lunch once or twice a week. Cha-om is part of the acacia family; in this dish the tender leaves are stripped from the stem and then stir-fried with garlic, bean thread noodles and egg and seasoned with fish sauce and white pepper. It has a unique and alluring flavor and with the noodles and egg is a satisfying treat. This dish is taught in Kasma’s advanced class G-3. To find out more about cha-om, see Kasma’s blog Cha-om – A Delicious and Nutritious Tropical Acacia. If you live in the San Francisco Bay Area, you can often find it, especially during the summer months, at Sontepheap Market on International Boulevard in Oakland. Wilted Greens Salad with Coconut-Lime Chilli Sauce, Fried Chinese Sausage, Crisped Garlic and Crisped Shallots (Yam Dtam Leung): Kasma first tasted this salad at the restaurant Bai Fern in Mae Hong Son. As with many of her recipes, she came up with her own version when she returned home. 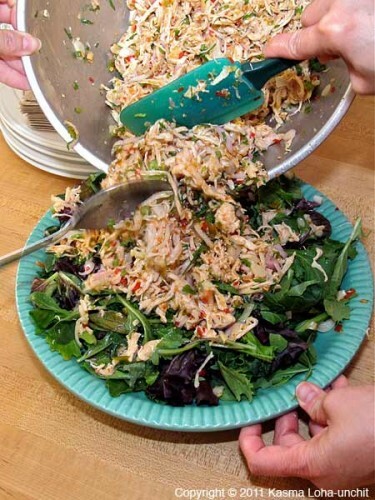 This salad has to be eaten to be believed – there is so much going on in the dish. Although Kasma has tried making it with spinach leaves, to experience it at its best you must have dtam leung greens. 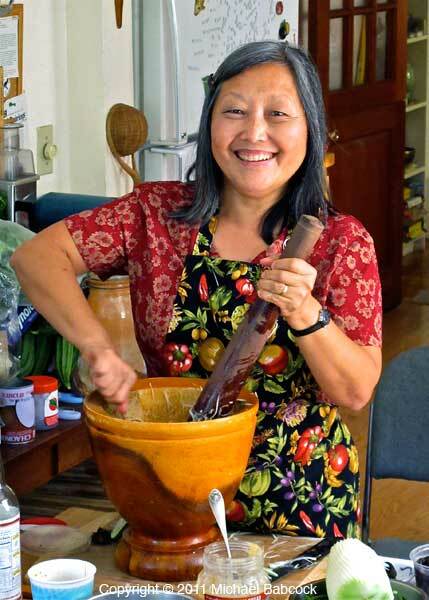 In the notes to her recipe for the class, Kasma says: “Dtam leung is a vine that grows readily during the rainy season throughout tropical Southeast Asia. Since its leaves look like ivy and the mature vines bear small gourd-like fruits, its common English name is ‘ivy gourd. '” In this salad, the tender leaves are blanched. We are fortunate to be able to get this vegetable on occasion at Sontepheap Market on International Boulevard in Oakland. 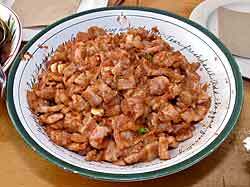 The dish is completed with small pieces of Chinese sausage, which adds a meaty, sweetness to the dish, a small amount of carrots for texture, thin rounds of green onions, shallots and a few peanuts. The sauce, made from fish sauce, lime juice, coconut cream, sugar and chillies, is equally salty and sour with a little background sweetness. 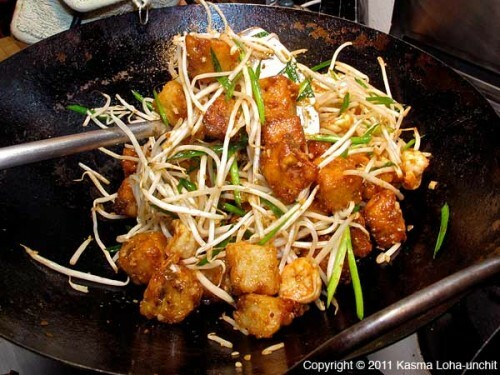 It is topped with crisp-fried garlic and crisp-fried shallots. The dish is a wonder of tastes – at one time you’ll get the sweetness from the sausage, then the sourness takes over with a bit of chilli heat. Different flavors come up: now coconut, now sausage, now the green, now everything’s blended together. It’s a wonder of textures – from the blanched vegetable, to the occasional carrot to the crispy shallots and chillies. I swear, I could have eaten the whole plate by myself! Except, that would have left no room for other equally delicious dishes. This dish is taught in Kasma’s advanced class H-4. Thai Muslim Goat Curry (Gkaeng Ped Pae): Goat curry is not your usual Thai dish. Goat, in Thailand, is eaten mainly by the Muslim population to the south. 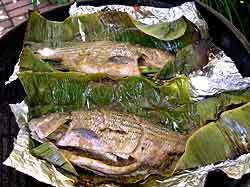 The first time I had goat curry was when we were snorkeling in Krabi province on a long-tail boat. The boat driver’s wife always provided lunch and one year Kasma asked if she could get goat. As it turned out, we had to buy the whole goat but it provided three meals worth of delicious food, including a goat curry. This recipe makes the curry paste from scratch, pounded in a mortar and pestle, with the many of the usual ingredients: dried red chillies, salt, lemon grass, galanga, krachai (or gkrachai), turmeric, garlic, shallots and kapi (shrimp paste). 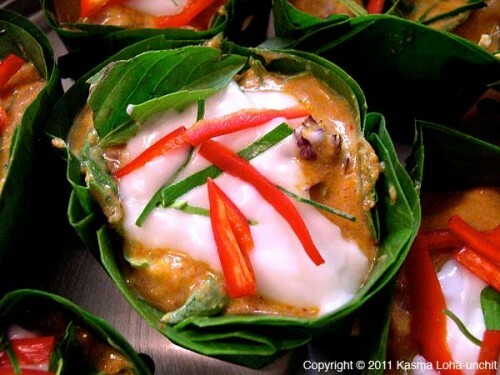 It uses coconut milk (not all Thai curries do, see Kasma’s blog on Thai Curries – Gkaeng (or Gaeng).) It’s further seasoned with toasted coriander and cumin seeds and in addition to the goat meat includes pea eggplants, providing a bit of the bitter taste. Kasma uses the goat as they do in Thailand, meat cut with the bone. It makes for a tastier, thicker and healthier curry. People sometimes complain that goat has a strong taste: in this dish, it is not overpowering and blends in seamlessly with the somewhat spicy curry paste. A delicious dish. 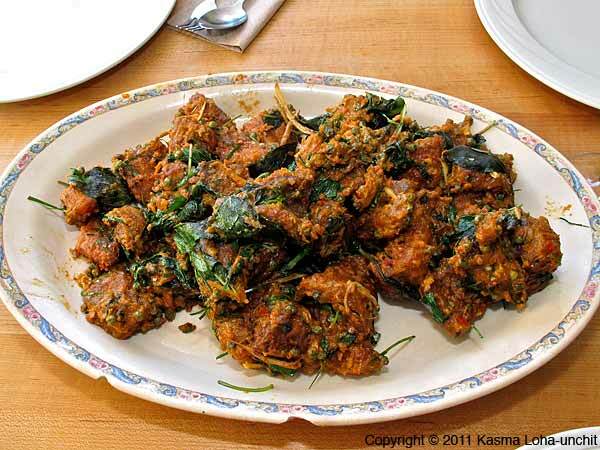 This dish is taught in Kasma’s advanced class H-1. This dish actually was in one of the very first advanced classes I took from Kasma back in the early 90’s. Because the evening classes are somewhat different than the weeklong classes, it just worked out that this dish ended up in her 4th advanced weeklong class. 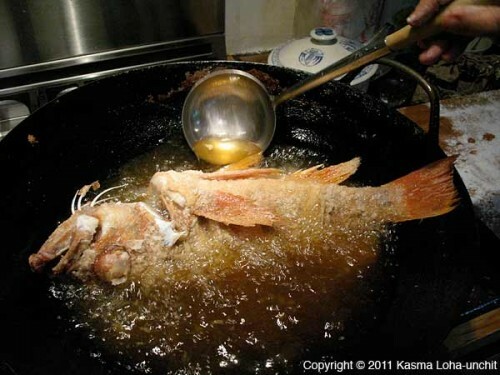 In this dish, the catfish is fried in chunks until it is nice and crispy. Then the curry paste (which has 17 ingredients in it) is fried in a bit of coconut cream (1/2 to 1 cup of cream only for 2 pounds of fish), then thickened, used to just coat the fried catfish pieces and tossed with kaffir lime slivers, some krachai (or gkrachai) and young green peppercorns. There’s really no sauce to speak of – just the coated fish with all of the intense flavors from the curry paste and herbs. Do click on the picture above to see a larger version. 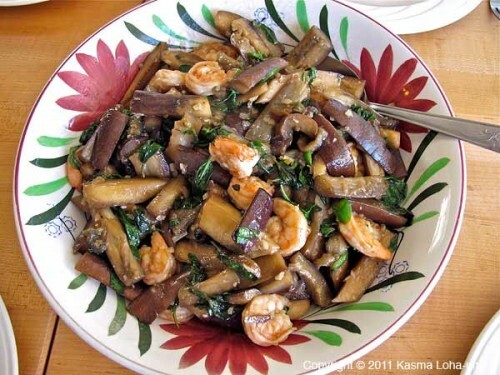 This dish is taught in Kasma’s advanced class B-3. Stir-Fried Prawns with Hot Garlic-Pepper Sauce (Gkoong Pad Gkratiem Prikthai): A deceptively simple group of ingredients, succulent prawns are mostly cooked, and then finished off in a sauce made from a paste made from garlic and fresh ground white peppercorns, Sriacha chilli sauce, fish sauce, thin soy sauce, vinegar and salt. 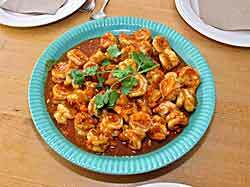 This dish is made by the combination of flavors, the pungent pepper, the bright garlic and the salty-sour-just-a-bit-sweet sauce. Made right, the combination lights up your entire palate. This dish is taught in Kasma’s advanced class G-4. Stir-Fried Pork Belly with Fermented Tofu Sauce and Thai Chillies (Moo Sahm Chan Pad Dtow Hoo Yee): I have saved the best for last. Although we often joke than my list of top 5 Thai dishes has about 20 dishes on it, this is currently at the top of the list. Probably more of a Chinese dish than Thai, it’s another hard dish to describe unless you’ve tried fermented tofu; in addition, this uses red fermented tofu rather than the more usual plain kind; the red color comes from wine. Fermented tofu is said to be an acquired taste: this was true for me: the first time I was offered fermented tofu I couldn’t eat it. Now, it’s one of my favorite things: it’s great in congee (jook). 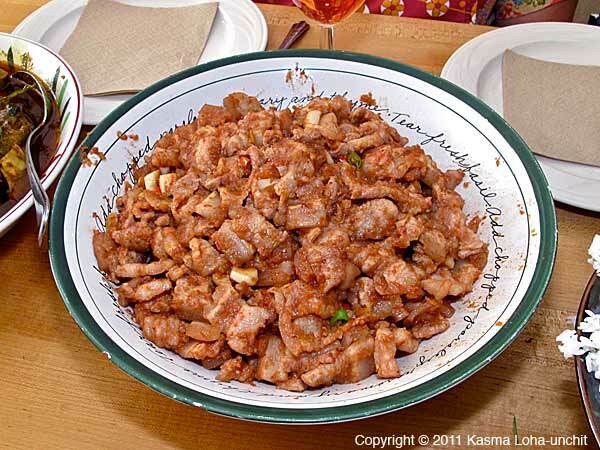 In this dish it is combined with another of my favorite foods: skin-on pork belly. Pork belly is the part of the pig used to make bacon; Asians often leave the skin on, providing another chewy texture to contrast with the layers of meat and fat. The dish also contains chopped garlic, garlic cloves in large pieces, Thai chillies and some of the brine from red fermented tofu. The result is delicious, chewy, slightly sour chunks of multi-textured pork belly with the occasional chunk of garlic and Thai chilli as accents. Heavenly. 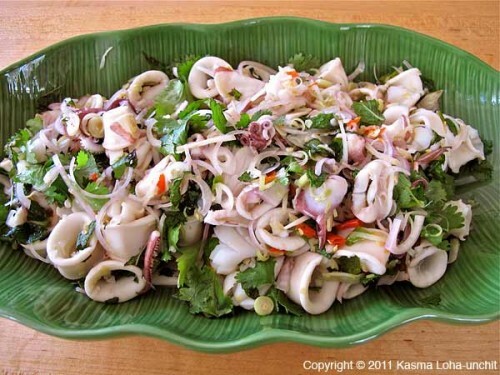 I first had this dish at our favorite Krabi restaurant, Ruen Mai. They make it slightly different: they deep fry the pork belly first to give it a bit of a crust. I prefer Kasma’s version. 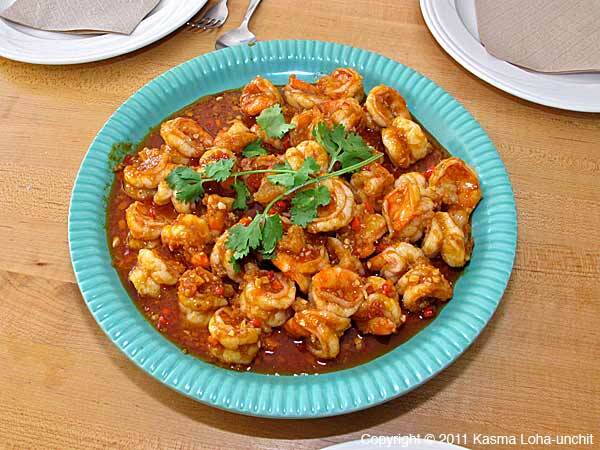 This dish is taught in Kasma’s advanced class H-2. Cassava Custard Topped with Coconut Cream (Dtakoh Man Sambpalang): This is more of a snack than what most people would consider a dessert. It’s an eggless cassava custard with a coconut cream topping. 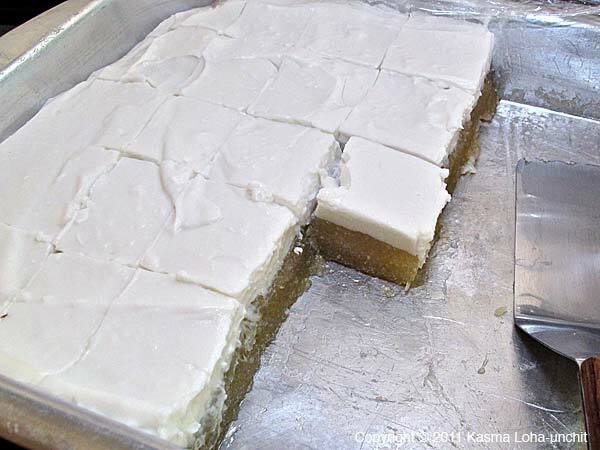 All that’s needed after such a delicious and complete meal is just a square to provide a bit of sweetness along with a bit of coconut to smooth away any residual heat. 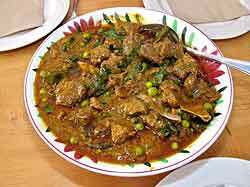 This dish is taught in Kasma’s advanced class G-1. Thai Sweet Tracks – Kanom Wahn. This meal is much more than the sum of it’s parts. I can single out one dish or another but the result was a meal that memory is a movement from one delicious taste, one delicious dish, to another. It’s one of those meals you wish would not end. If there’s another place in America to get a meal like this, I have not come across it! 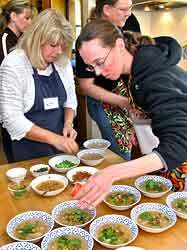 We recently blogged on our Weeklong Thai Cooking Classes. Kasma’s Picasa Albums – including 100s of photos, mostly of Advanced Weeklong classes. You can, of course, argue that I’m biased; after all, I’m married to Kasma. On the other hand, this makes me very well qualified on the subject as well, at least for a fahrang (the Thai word for a Caucasian). I’ve traveled to Thailand every year since I got together with Kasma in 1992. I’ve been all over the Kingdom and eaten in great Thai restaurants all over Thailand. I’ve gotten to listen to Kasma talk about her passion, Thai Food, at home, in restaurants in Thailand and sitting on the living room couch. 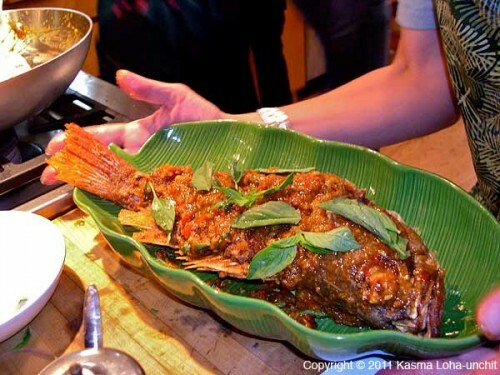 Note: Kasma no longer offers the weeklong Thai cooking classes. I will leave this blog up as a historical record. During July and August, Thai cooking teacher Kasma Loha-unchit used to offer weeklong Thai cooking classes in the San Francisco Bay Area for people who wanted to learn how to cook Thai food as authentic and delicious as that found in Thailand. 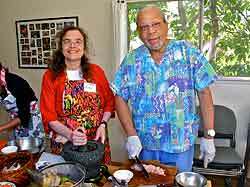 The classes were called “intensives” because for 5 straight days participants spent all day learning, cooking and eating Thai food. Unfortunately, we no longer offer these classes – they were an incredible amount of work and as Kasma edges towards retirement, she has stopped offering them. In this blog we’ll try to give you a sense of what those classes were like. Click images to see larger version. There’s also a slideshow further down. Kasma, who offered 4-session evening series classes starting in 1985, began offering these classes in 1998 because of requests from people who discovered the classes through Kasma’s website – thaifoodandtravel.com. She very quickly began offering two of the Beginning/Intermediate intensives each summer along with two advanced weeklong classes. Hundreds of people from all over the world have attended the Beginning/Intermediate class, many of them going on to take the Advanced weeklong classes as well. Kasma teaches all of her classes in her home. The more casual and intimate setting allows people to relax more and to get to know one another. Since most students will be cooking in their home kitchen, it makes sense to learn in a home kitchen similar to what they will find when they return home. The Beginning/Intermediate class combines the evening Beginning Series and evening Intermediate Series with some extras; it introduces most important Thai ingredients and many of the cooking techniques, including using the mortar and pestle to make pastes. 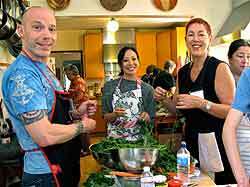 The Beginning/Intermediate class lays the foundation of how to balance flavor groupings to create Thai tastes, whether using a recipe or not. Everyone starts with the Beginning/Intermediate class: it’s the only way Kasma can insure that everyone in the Advanced classes has a common set of essential information and that everyone has been exposed to harmonizing Thai flavors. 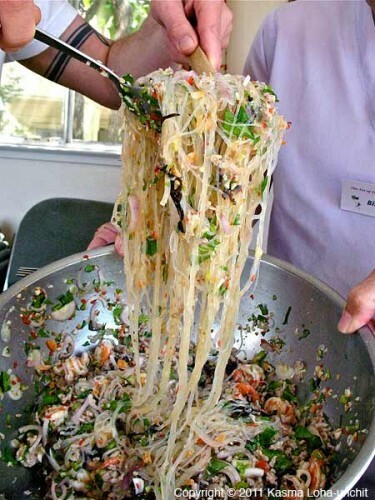 Many of the recipes in the Beginning/Intermediate class are familiar to anyone exposed to Thai restaurants in the U.S. – Basil Chicken, Green Curry, Shrimp Cakes, Pad Thai noodles – to name a few. 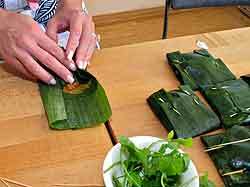 In the Advanced weeklong classes more Thai ingredients (less common ones) are introduced along with new techniques and the refining and expansion of previous techniques. 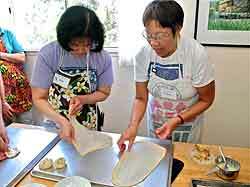 In addition to more familiar recipes, the Advanced classes include more recipes that are not so common in this country. 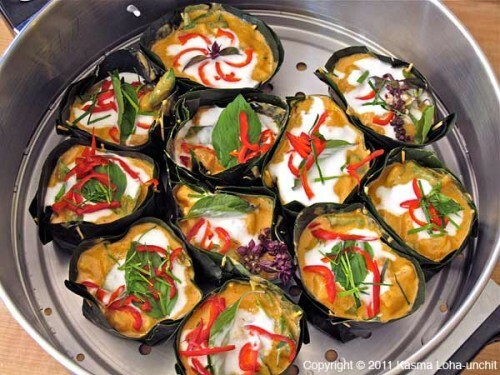 Kasma estimates that the Thai restaurants in the U.S. offer around 5% of the total number of dishes in Thailand; the advanced weeklong classes are a chance to learn how to cook and to eat many of the other 95% of Thai dishes. 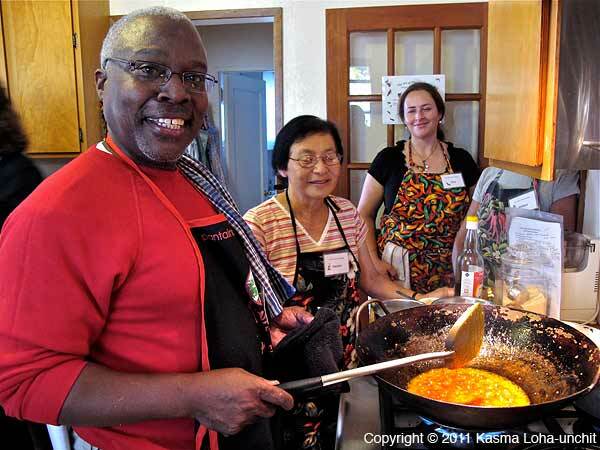 Kasma started out with just one Advanced weeklong class and added 3 more in response to demand from students, who wanted to keep learning more dishes and more about Thai food. The format of all of the classes is the same. 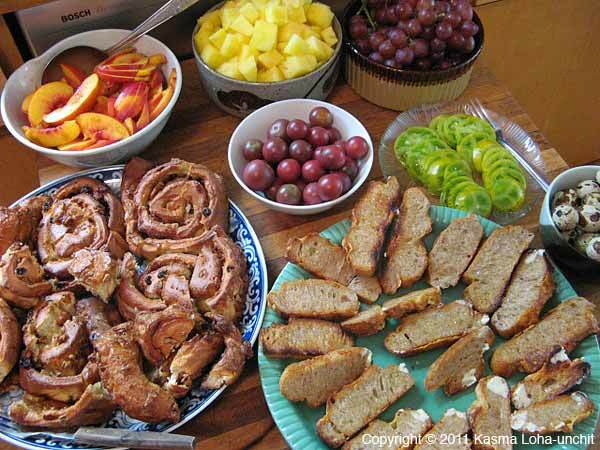 Class always starts with a delicious breakfast consisting of pastries and cheese breads from local (mostly co-operative) bakeries, organic heirloom tomatoes and tree-ripened organic fruits from the Berkeley Farmers market, quail eggs with Thai dipping sauces and a different Asian snack each day. Peet’s coffee and a selection of teas are also served. The breakfasts are fantastic! After breakfast, everyone sits at the long table and Kasma goes over each of the recipes. This teaching session necessarily takes a bit longer in the Beginning/Intermediate class: Kasma needs to introduce the ingredients for the first time as she goes over each of the recipes. Questions are encouraged and part of the process involves smelling, tasting and touching Thai herbs and some comparative tasting (of coconut milks, for example). Class most days starts at 9:30 a.m. and the sitting instruction can last anywhere from 2 to 2-1/2 hours (there’s a break in the middle to sample more of the breakfast). After the initial instruction, the group breaks up into teams, each team working on 1 or 2 recipes; each team does all of the prep with Kasma supervising and instructing further as needed. After the ingredients are prepared, the food is assembled. Unlike other classes, the assembly is done as a group: everyone gets to watch each dish being cooked and finished. Initially (the first day or two) Kasma does much of the assembly herself and each day students take over more and more of the work, with Kasma watching. Each dish is designed to serve many people: you learn to cook dishes exactly the way you would cook them at home. 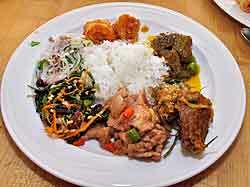 Assembly of many of the dishes involves a series of tasting exercises. The essence of Kasma’s classes is learning to balance flavors. (See Kasma’s article Creating Harmonies with Primary Flavors.) 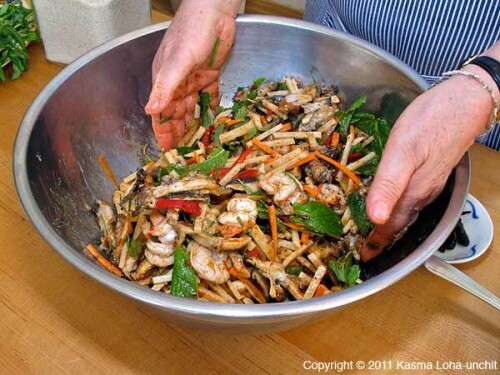 Most of Kasma’s recipes give a range of quantity for many key flavoring ingredients, such as fish sauce, lime juice or palm sugar, because these ingredients can vary widely and blindly following a recipe with just a set quality may not produce a very tasty dish. 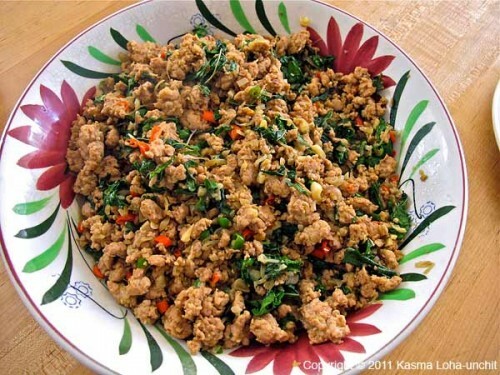 (See the blog Following Thai Recipes.) Kasma will add a certain quantity of an ingredient, say fish sauce, and then everyone gets a chance to taste what the dish tastes like; more fish sauce, or palm sugar, or lime juice will be added and after each addition, there’s another tasting and students get to see how the flavors interact and how they become more layered and more complex, sometimes with just a small extra addition of something. I’ve had many experiences with these tasting exercises where I thought something tasted really, really good – I would have stopped right there. 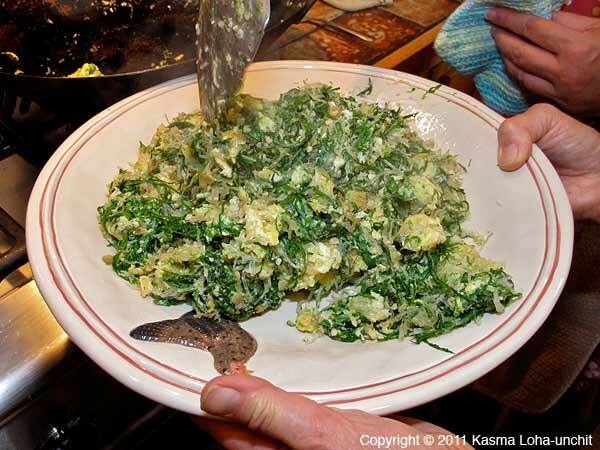 Then Kasma adds just a bit more of something and the flavors POP!!! into a revelation. 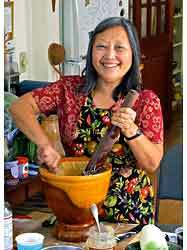 It’s a chance to see, to experience the alchemy of Thai cooking. Each day there’s a dish or two that is cooked earlier on to serve as lunch or as asnack to bridge the time until you sit down to eat a Thai feast around 3:00 or 3:30 p.m. Most people find they don’t need to worry about eating dinner – they go away very full indeed! We provide beer or wine, as desired, and lemon- or limeade. Each day finishes with a Thai dessert. 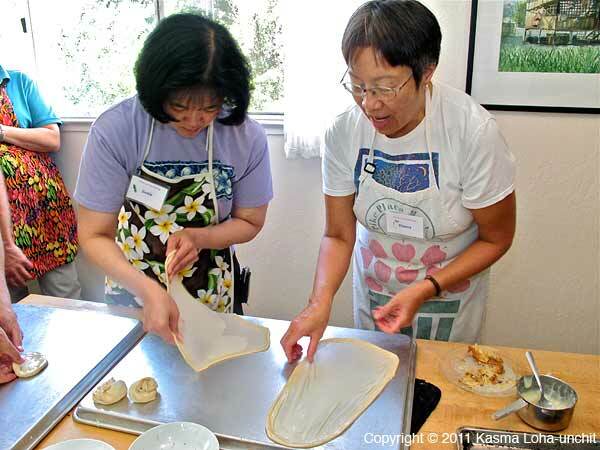 These classes are a great way to try some of the wonderful variety of Thai kanom wahn (“sweet snacks”). One day during most of the weeklong classes is a one-dish meal day. 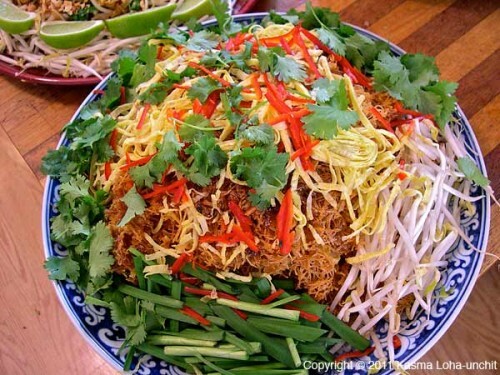 You’ll learn many noodle dishes, from familiar dishes, such as Pad Thai, to the other noodle dishes that Thai people actually prefer: such as Stewed Duck Noodles, Boat Noodles and Kao Soi (Chiang Mai Curried Noodles). Some of the non-noodle (one-dish meal) dishes include Kao Man Gai (Poached Chicken Rice), Salted Black Olive Rice, Muslim Yellow Rice and Pork Rice Soup. The last day is a little different. We start Friday with a 2-hour or so field trip to the Old Oakland Farmer’s Market, with its many Asian vendors, and to some of Kasma’s favorite markets in Oakland’s Chinatown. This is a chance for students to learn how to negotiate Asian markets and to learn about some of the exotic Asian ingredients that are found there. Every single one of our Advanced weeklong classes has wanted Kasma to include the optional field trip. We then return and assemble the day’s meal, which always includes grilled dishes on Friday, and on this day we eat out in Kasma’s beautiful garden. After the Beginning/Intermediate class you will have been introduced to most of the important Thai ingredients, will know most of the main cooking techniques and will understand how to balance the flavor groupings to make delicious Thai flavors, with or without a recipe. 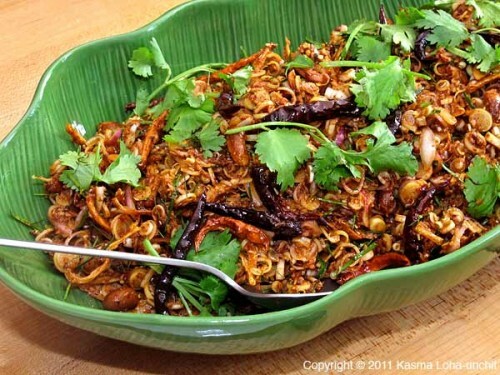 You will have over 40 delicious Thai recipes with which to amaze and delight your friends. Be warned, you may find out, as have many students over the years, that you no longer wish to eat in local Thai restaurants because the Thai food is better at home! The format is essentially the same – breakfast, initial instruction and then breaking into teams, coming together so that everyone can see how a dish is cooked and finished. In the advanced weeks, students do pretty much everything under Kasma’s supervision. Each Advanced weeklong class has 40 to 45 delicious Thai recipes. 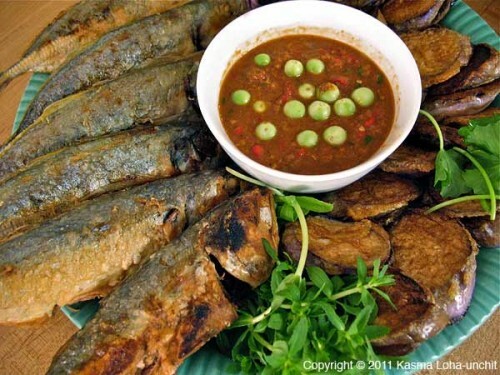 Many of these are dishes seldom seen outside of Thailand. 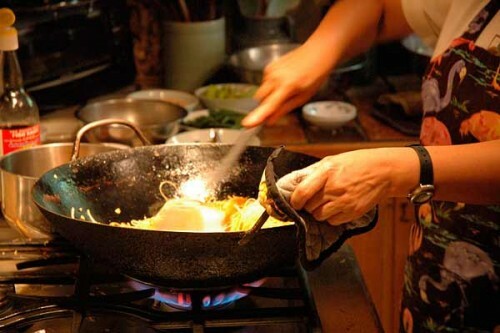 You’ll be able to cook dishes at home that you can’t find in the local Thai restaurants. After you’ve taken the Beginning/Intermediate class and all 4 Advanced weeklong classes, you’ll have well over 200 Thai recipes to choose from. There’s an English proverb that dates back to the early 1600s that says: “The proof of the pudding is in the eating.” A cooking class can be lots of fun but ultimately you want to know that what you are learning to make is fabulous food. People take the Beginning/Intermediate class pretty much for one reason: to learn how to cook delicious Thai food. 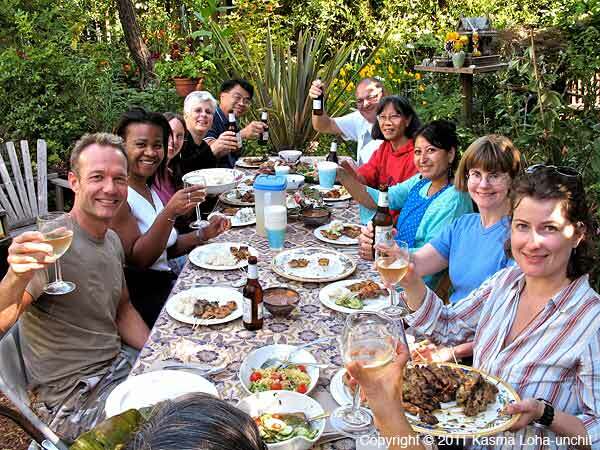 After this class, people return for multiple reasons: to learn more about Thai cooking, because they had so much fun during the first week and to eat. They come to learn to cook Thai dihes that they don’t find anywhere else outside of Thailand. Always, though, the main reason people return is because the food is so fabulous. 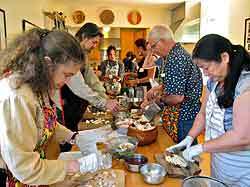 These were truly unique classes – there is probably nowhere else in the United States that you could eat some of these fabulous meals. (The food in the Beginning/Intermediate class is fabulous as well; the Beginning/Intermediate people don’t believe us when we say the food in the Advanced classes is even better.) We have students who tell us that Kasma’s food is even better than what they have in Thailand. People return time after time – many people have taken all 5 of the weeklong classes and regularly ask us when Kasma will offer the 6th – because the food is so good. 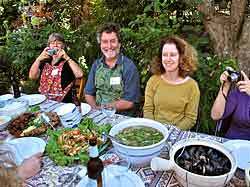 Several people have repeated one or more of the Advanced Weeklong classes because they wanted their Thai food hit. Other students go on to take the evening series Advanced classes. We are currently enrolling people for the July & August 2013 classes. If you’re interested, please check out some of the links below and then get in touch. 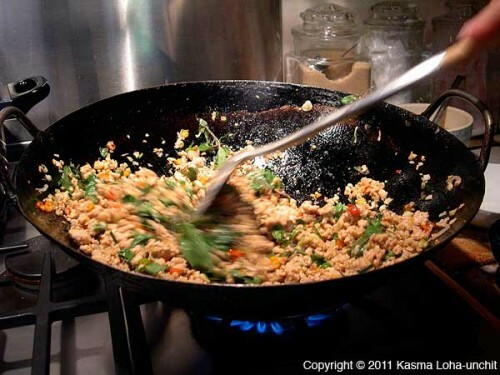 You are currently browsing the Thai Food and Travel Blog blog archives for October, 2011.